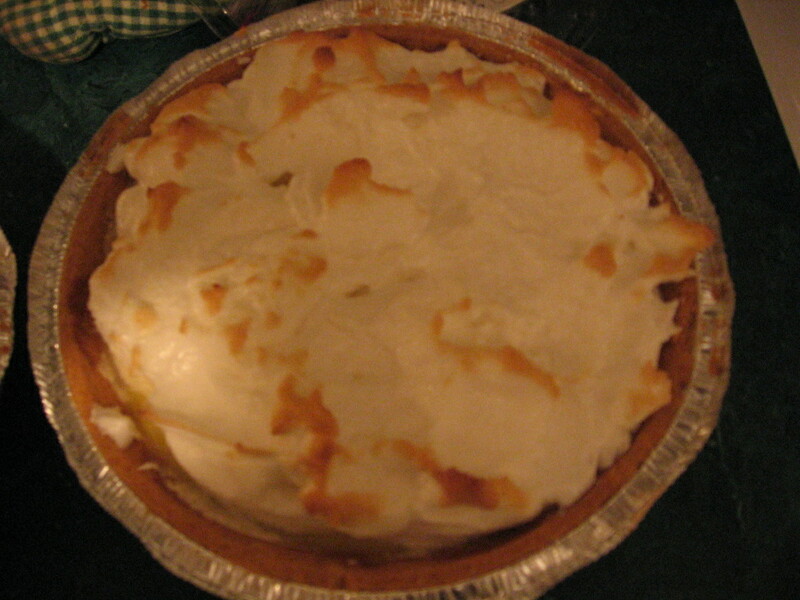 If Aunt Gail’s sweet potato is my favorite pie, her key lime is a close second favorite. Every time I visited her, she had a key lime pie waiting for me. This is another serious Southern pie, native to the Florida keys and is very easy to make. It is also inexpensive and doesn’t require a lot of ingredients. I like to decorate my pie with lime slices. Cooking Time: See note in final instructions. 3/4 cup lime juice (you may use more or less juice depending how limey you want your pie). If it gets too runny, add an extra egg yolk. Pour sweetened, condensed milk into a bowl. Add egg yolks & stir until smooth. Pour into pie crust. Place egg whites in a large, very clean bowl. Beat with mixer at high speed until soft peaks form. Add sugar gradually, while beating. When you can turn the bowl upside down without anything falling out, you’re done. Spread meringue on pie, mounding it. Make sure it touches all edges of the crust. Aunt Gail insists that she only bakes her pie “in preheated 400 degree oven for about 5 minutes, until lightly browned.” However, whenever I have done this, I end up with key lime pudding. So, I follow the baking time from The Joy of Cooking which says to bake key lime pie for 35 minutes at 350 degrees which has worked well for me. Refrigerate for at least 4 hours to allow the pie to thicken. If you are in a hurry, pop the pie in the freezer for 20-30 minutes and then refrigerate. Juice: Aunt Gail says you can mix limes with lemons to add variety. I like to stick with limes. Key limes are best if available. If not, you can buy bottled key lime juice at a specialty grocery store like Whole Foods. If all else fails, bottled non-key lime juice will suffice, but it isn’t as authentic. Meringue: Any grease in the bowl or on the beaters will interfere with the beating of the egg whites. Make sure both bowl & beaters are very clean. I struggle with the quantity of lime juice. I’ve made this pie 3 times with 3 different types of limes and they obviously yield different amounts of juice. Today, I have actual key limes but I’m nervous about the amount of juice. Thank you so much for your post. I actually made this pie over the weekend for a party and measured the amount of juice I used so that I could accurately respond to your question. I used 3/4 cup lime juice, which is about how much juice three regular sized limes should yield. If you use real key limes, you’ll need to use more than three because key limes are smaller. You can use more or less juice depending how citrus-y you like your pie. 3/4 cup makes the pie tangy, but not overpowering. If you use more juice than that, make sure it doesn’t get too runny. If it gets runny, just add another egg yolk. If you’re in a rush, you can use bottled lime juice, but fresh limes are always best when available.